New Jersey prosecutors are notorious for prosecuting drug crimes to the full extent of the law. This is a particular problem for anyone charged with cocaine distribution because the penalties for this offense are severe. If you are convicted of cocaine distribution in the State of New Jersey, you could end up spending the next 20 years in prison. The Tormey Law Firm is a team of criminal defense attorneys who take pride in representing clients throughout Essex County, including Bloomfield, South Orange, and Nutley. We understand that addiction and the need to provide for your family can be powerful motivators. That’s why we will do everything possible to help you combat your charges and keep you out of prison. Our litigation team includes an attorney who previously worked at the United States Attorney’s Office, as well as a former municipal and county prosecutor, so we have the institutional knowledge needed to win your case. If you have been accused of cocaine distribution or cocaine possession, call us today at 201-654-3464. Also, check out our Successful Cocaine Distribution Verdicts page to see examples of drug cases that we have won. N.J.S.A. 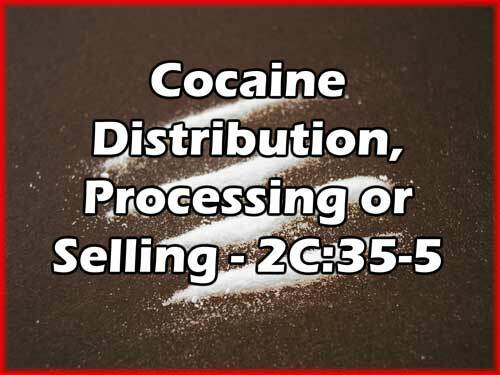 2C:35-5 makes it unlawful for a person to manufacture, distribute, or dispense a controlled dangerous substance (CDS) such as cocaine or crack cocaine. Additionally, the statute makes it a crime to possess a CDS with the intent to manufacture, distribute, or dispense the drug. This includes any cocaine adulterants, dilutants, or cutting agents. Keep in mind that anyone who is convicted of a first or second degree crime faces a presumptive term of incarceration, regardless of prior criminal history. This means that a conviction for one of the more serious cocaine distribution charges will result in mandatory prison time. Additionally, since distributing cocaine is a violation subject to sentencing under the Brimage Guidelines, you will not have an opportunity to argue for a lighter sentence if you are convicted. The penalties for cocaine distribution may be enhanced if the offense occurred inside a school zone or near a public park. In these cases, you will be subject to a minimum mandatory sentence of three years in prison, regardless of the weight or amount of drug. Additionally, you can be fined as much as $150,000. If you are accused of selling cocaine to a minor, regardless of the location of the sale, the penalties against you can be doubled. These enhanced penalties may also apply if you are accused of selling cocaine to a pregnant female. In the most extreme cases, a drug distribution charge can be elevated to a Leader of a Narcotics Trafficking Network charge. Anyone who conspires with two or more other persons in a scheme to distribute cocaine may be charged as the leader of a drug organization and can be sentenced to life imprisonment if convicted. The experienced attorneys at the Tormey Law Firm will aggressively defend you against your cocaine charges, whether you are accused of cocaine possession or cocaine distribution. Take the first step to ensuring that your future is protected by calling us at 201-654-3464. You can also fill out the firm’s online contact form to schedule a free consultation at our office in Newark, NJ.